Races, walk-a-thons, and bike-a-thons are popular fundraisers for nonprofits and charities of all kinds. Due to their relatively short distance, 5Ks (3.1 miles) are a popular option for nonprofit fundraising. Their approachable distance means they attract more people than half-marathons or marathons and tend to be fun family events. If you’ve ever thought of organizing a race for your nonprofit, the planning process may seem overwhelming. While planning a 5K isn’t exactly easy, the result is rewarding for you and the payoff for your organization and community can be huge. So, how do you plan a 5K? Like anything, breaking the 5K planning process up into small steps can help you tackle it and start an annual tradition for your organization. Like any fundraiser, you’ll want to start by researching similar events in your area. Are there any other charity 5Ks? How long have the races been taking place? What is their entry fee? Where is their course? Look at all of these things to help guide your decisions for your own race. You can’t plan an event on your own! Decide who will help you plan and execute the event. You’ll need people to help with publicity/marketing, event planning, and day-of management. If your team is small or stretched too thin to help, enlist some of your volunteers. Since you’re planning this 5K on behalf of your nonprofit, your organization will probably be your theme. Along with this, you’ll want to decide what the entry fee will be and what proceeds from the race will go toward. Will the money be donated to your overall organization or will it go toward a specific project or aspect of your nonprofit? Make this clear in your promotional materials and race literature so people know what their participation means. Decide when and where you’d like your race to take place. Is your course going to be a loop or out-and-back where runners will end at the same place they started? Or will it be a point-to-point race where runners start at point A and end at point B? The type of course makes a difference in the race experience so think about the scenery and what your runners would enjoy most. In addition, you’ll need to contact city officials to confirm availability and complete any necessary permits. Once you have some of the basics of your race out of the way, build a budget for your event. Since one of the goals is to raise funds for your organization, you want to set a budget and keep careful track of it so you know what the race is costing you as planning progresses. The last thing you want to do is get to post-race stage and learn that the race has cost your nonprofit money. It’s important to have a race website or, at the very least, a page on your organization’s site with race information. This lends credibility to your event and allows prospective registrants to easily find all the information about your race. Include essential information like date, start time, entry fee & registration, course information, where proceeds go, and any other information someone might need to help them sign up for your race. Sponsors can help offset the cost of the event by donating money, or they may donate items like snacks, drinks, or swag that increase the quality of your event. Look for companies that align with your organization. For instance, if the race will benefit your animal shelter a local pet supply store or dog groomer would be a great sponsor. Choose a race registration service that makes your registration process as simple as possible for you and your entrants. When should you open registration? Most races open registration for the next year immediately after the current year’s event to give people an entire year to register. For a charity 5K, this probably isn’t necessary but it can’t hurt to leave registration open for that long! If you don’t want to leave registration open for an entire year, six months should be plenty of time. People can’t run your race if they don’t know about it! Promote your 5K via social media, your email newsletter, and posters/flyers at running stores. It’s also a great idea to target people who may be interested in your nonprofit. To use the example of a race raising money for an animal shelter, putting up flyers at dog parks, pet supply stores, or groomers is a great way to reach people who would be interested in helping animals but aren’t in running circles. Just be sure to ask permission before putting up flyers! Even though the purpose of your race is to raise money for and awareness of your organization, it is still a race and you’ll need a way to time your contestants. It’s best to hire a professional race timer for this. The timer will likely be the largest part of your budget but for many runners, it’s all about the time so make sure you choose a competent, experienced timer. While you can order simple, generic race bibs online for a relatively low cost, keep in mind that many runner collect their race bibs and enjoy adding unique ones to their collection. A generic bib may discourage people from running your race again in the future. Your race timer may be able to recommend a company for custom race bibs, or you can find one with a quick internet search. Not every race gives all participants medals so you’ll need to decide if each participant will get a medal or if only the top 3 will receive one. People do expect a race shirt in their race packet, though! Many races provide athletic shirts made of polyester or other tech fabric but for a smaller or inaugural race, cotton is perfectly acceptable. You’ll need mile-marker and directional signs for the course, as well as signs for parking, registration tables, first aid tents, and anything else you want participants to be able to find easily. Invest in quality signs and you can use them for years to come! To keep runners hydrated, plan to have at least one aid station with water and/or electrolyte drinks about halfway through the course. You should also have portable restrooms at the starting/finish lines and halfway through the course. The number of restrooms you’ll need will depend on the number of participants you have. Place trash cans at the starting/finish lines and near the aid stations so people have places to put their water cups once they’re done with them. Race day will be an all-hands-on-deck day and you’ll need volunteers to help you and your team make sure everything runs smoothly. Check with local high schools, colleges, businesses, and youth groups to find volunteers looking to fulfill community service hour requirements. Police and security help keep runners safe by controlling the flow of traffic and keeping the crowds under control. When you check for course availability and fill out your permits, city officials will be able to tell you what kind of police presence or security you should have at the event. If not, ask them and they should be able to point you in the right direction. Most 5Ks don’t require a lot of medical professionals so it’s a good idea to contact a local sports medicine professional to see what similar events have had in the way of first aid. Still, plan on having a first-aid tent with a basic first-aid kit. Once the race is over, you and your volunteers will need to make sure the course is clean. If you leave it better than you found it, your city will be happy to host your event again. If you leave a mess, you risk being banned, which is no good for your organization! During the week after the race, email to all of your participants thanking them for taking part in your event, inviting them back next year, and letting them know when registration will be open. You should also include a link to a post-run survey to get feedback about what they liked, disliked, and what they’d like to see done differently. This feedback is crucial, especially for a new race! 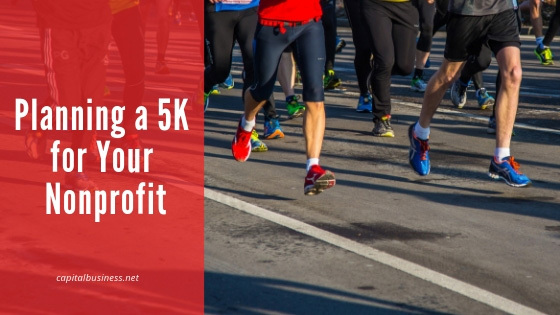 There is our step-by-step guide to planning a 5K your non-profit! Have you ever planned a race? Do you have tips to share? Join the discussion on Twitter or Facebook.